Silvana was was telling me about her family. She sketched on a piece of paper the relationships of each sibling and their children. I asked her why her brother’s name was missing above his list of children. “Diving accident” she went on to explain. It is reported there are up to ten to twenty diving fatalities each year in Nicaragua. Using only a car air compressor on a boat feeding unclean air to a diver below using not much more than a garden hose is not a good start. These divers are then going down to hazardous depths without training on the dangers and precautions. Deaths are attributed to the deadly “decompression syndrome”. The root cause is desperation. The need for fishermen to make a living, to feed their families. It’s a worldwide plight. As fish stocks are depleted, fishermen need to go further out. Without enforced fish management controls the cycle continues with ever shrinking available fish. And that’s exactly what’s happening in this small fishing community. Divers are forced go further out into deeper water to fish for the high value lobster. And it is increasingly coming at a high cost of life. But there’s one man who’s mission is to change this cycle. A Belgium plumber. I met him at the local Rotary international club in San Juan del Sur in Nicaragua. It’s a fledgling club. So much so, at their meeting I went to they were still discussing about opening a club bank account. But you’d never know. This small club is a powerhouse of activity serving their local community in a big way. It’s a central coordination hub for volunteering groups of senior high school kids from the USA. Each group takes on a school. It’s like a version of the TV property makeover shows. They’ll paint all the class rooms inside and out, erect water tank stands, install plumbing. They’ll leave after a week leaving not only a pristine looking school, but grateful pupils and their teachers. But more so there’s a bus load of kids heading to the airport for home, their lives so much more positively changed from the experience. The Belgium Plumber, a man by the name of Christian Poseidon is one of the main coordinators of all these activities. But his real passion, along with his enthusiastic fellow team members, is making a difference by what happens under water. I’ll let Christian explain…. While the marine life outcome of Christian’s work is still at a developmental stage, it is attracting significant support from global funding sources to expand his work. And a lot of interest. Including down under. Through some contacts I was fortunate to connect Christian and his team with some additional resources by way of specialist lobster farming researchers at the University of Tasmanian. As well there is growing interest in Christians work from other communities to replicate the benefits of not only generating increased fish stocks, but also providing diving tourism benefits at these new reef sites. Also, may be you know of senior high school students whom you think could benefit by participating in similar school projects? If so contact your local Rotary club. Similar programs operate in Oz. For example one is the Mill Point Rotary Club in Perth. Instead of the annual Schoolies end of year drink to get drunk fest, a group of kids go to Laos to work on similar projects. Nothing wrong with a few drinks and a great party, but I wonder who comes home richer for the experience? If I can assist with contact information on any of the above, please feel free to contact me. 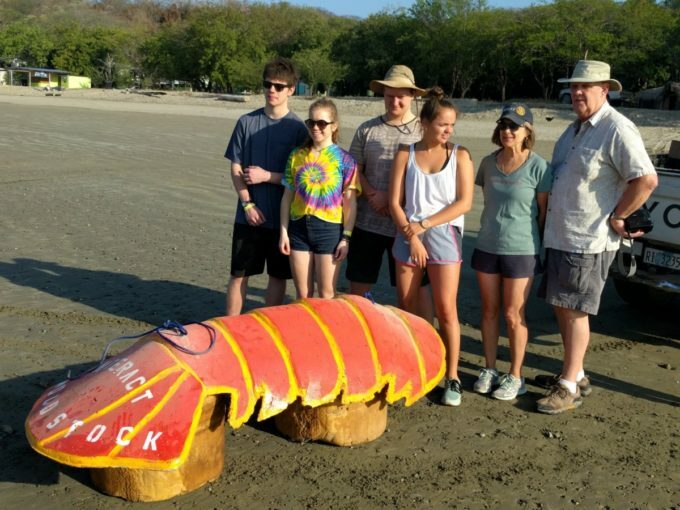 4 comments On Why is a Belgium Plumber sinking giant Lobster Tails in Nicaragua? Thanks Max. There’s some inspiring people behind the story. Really nice to hear you are enjoying it Leslie. It’s my privilege to have the opportunity to provide it.